Clyde Yancy, MD, MSc, vice dean for Diversity and Inclusion and chief of Cardiology in the Department of Medicine, presented at the Student National Medical Association’s Medical Education Conference. 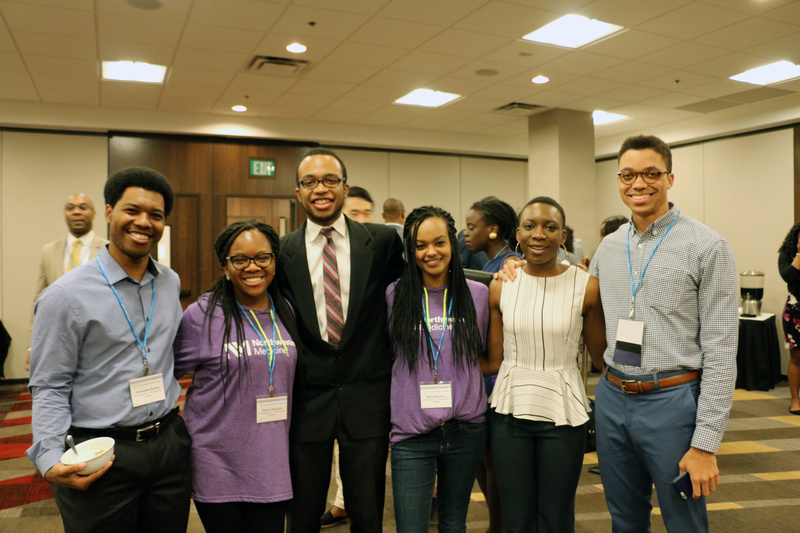 A group of Northwestern medical students, residents, faculty and staff recently traveled to Atlanta to join more than 1,800 pre-medical and medical students from across the country to participate in the Student National Medical Association’s (SNMA) Medical Education Conference. The annual SNMA conference is one of the largest gatherings of underrepresented minority medical students in the country and was organized around the theme, “Lighting the Way: Creating Health Equity through Education, Advocacy and Service.” The five-day conference highlighted the importance of clinical excellence and community engagement in solving the health disparities of today and focused on opportunities for students to grow as future physicians. 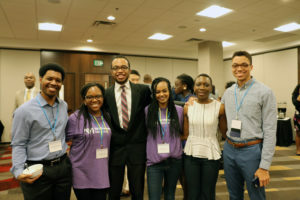 The SNMA conference was also an opportunity to network and connect with promising pre-medical students considering what medical school to attend in the future. Fourth-year Feinberg students, Leslie Okorji and Imo Uko, met prospective medical students at the Northwestern Medicine booth at the Student National Medical Association’s 2017 Medical Education Conference. In a keynote presentation, entitled “Beyond the Call of Duty: Building Resilience in Residency and Beyond,” James Chandler, MD, Lavin/Fates Professor of Neurological Surgery, discussed physician burnout and the importance of developing the ability to properly adapt to stress and adversity. “A sense of mission and meaning is the antidote to burnout,” Chandler said, and stressed the need for physicians to practice wellness and study their own coping mechanisms. The conference also featured plenary sessions tackling the complexities of implicit bias and microaggressions in medical education, the impact of violence on public health and the importance of physician advocacy in healthcare. Both pre-med and medical students had an opportunity to expand their knowledge through innovative professional development workshops. 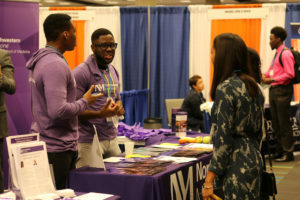 Throughout the conference, several medical students, faculty and residents represented Northwestern Medicine and the McGaw Medical Center of Northwestern University in the exhibit hall to field questions from pre-med and medical students considering Northwestern. Jacqueline Hairston, MD, a first-year resident in obstetrics and gynecology, attended the conference for the first time after it was suggested by her co-resident. Students and residents from Northwestern and all across the country enjoyed a reception hosted by the McGaw Medical Center of Northwestern University. On the final day of the conference, McGaw hosted a reception to provide an additional opportunity for attendees to interact with Northwestern Medicine residents and faculty. 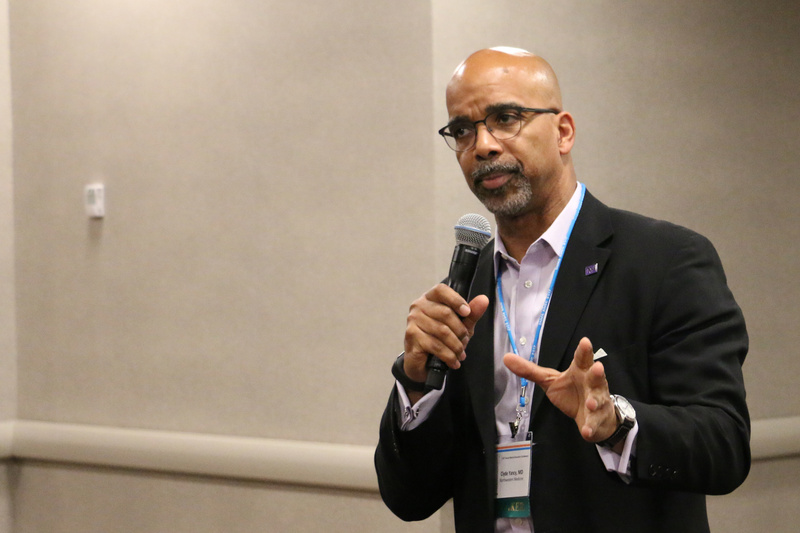 Several key Northwestern diversity and inclusion leaders, including Yancy and Jabbar Bennett, PhD, associate provost and Northwestern University’s chief diversity officer, addressed the audience of nearly 300 medical students. A panel of residents offered insights about their personal journeys to Northwestern Medicine and answered questions from students about the Northwestern community, touching on both the high and low points of residency. Shortly before the SNMA conference, several Northwestern students and residents participated in two Latino Medical Student Association (LMSA) conferences, hosted by the University of Michigan Medical School and Hofstra Northwell School of Medicine. LMSA provides students with opportunities to engage with their peers and physician advisors to promote outreach and advocacy for underserved communities in medicine, and professional development.